Sydney-based actor, composer and musical theatre performer Brent Hill will play wannabe rock star Dewey Finn. With an impressive lineup of musical theatre credits including multiple awards and nominations for his starring roles in Little Shop of Horrors, Once and Rock of Ages, along with numerous appearances in The Production Company shows, Hill was recently seen alongside Hugo Weaving in The Resistible Rise for Arturo Ui at Sydney Theatre Company and in Eddie Perfect’s Vivid White at Melbourne Theatre Company. Of the Australian child cast, Andrew Lloyd Webber said: “I’ve just seen all of the audition tapes for School of Rock in Australia and I know we’ve got a really great cast. We’ve got great kids in a show that is all about how music can empower children. School of Rock producers, GWB Entertainment stated: “After an exhilarating auditions process reviewing over one thousand submissions from children all over Australia, we are thrilled to have discovered a sensational line-up of 36 guitar shredding, drum thumping, bass slapping and keyboard playing prodigies. 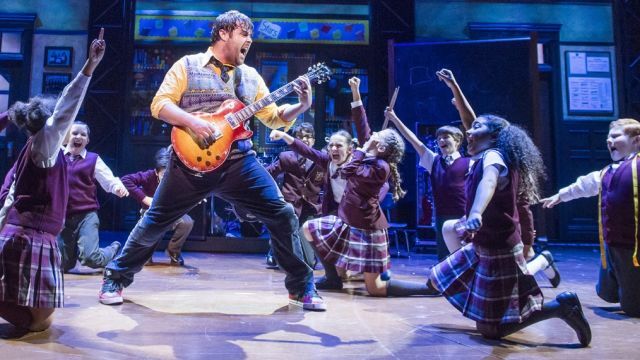 Due to popular demand, new tickets for School of Rock will be released on Monday 28 May. Based on the hit film, this hilarious new musical follows Dewey Finn, a failed, wannabe rock star who decides to earn a few extra bucks by posing as a substitute teacher at a prestigious prep school. There he turns a class of straight-A students into a guitar-shredding, bass-slapping, mind-blowing rock band. Featuring 14 new songs from Andrew Lloyd Webber and all the original songs from the movie, this high-octane smash delivers face-melting guitar riffs and touching romance in equal doses. Tickets from $69.90 *Subject to availability. $69.90 is restricted view seating on all performances. An additional transaction fee of $6.60/order applies to all online bookings. Images: (top) London production & (lower) Australian cast (photographer: Jim Lee).